Tuesday marked the official arrival of fall and, for many, that news is better than music to the ears. Crisp days filled with sunshine, colorful foliage, weekends filled with football, the opportunity to wear hoodies almost anywhere and, of course, every kind of pumpkin spiced foods and beverages are just some of the things that make this time of year so special. Like summer before it, though, the autumn does come with some potential pitfalls to pets and their owners. And while we are here 24-7 to help with any emergency situation you and your “furkid” encounter, we also believe in education and taking preventative measures to avoid such scenarios. So as the leaves begin to change please keep in mind these pointers and tips so that you and your pets enjoy this fall to its fullest. 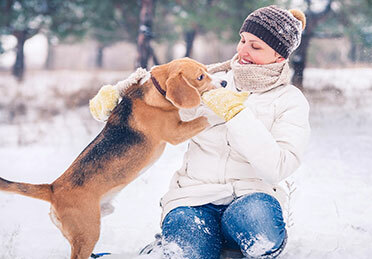 Dogs and cats, just like humans, are prone to allergens in the atmosphere. The arrival of fall brings about higher levels of ragweed pollen in the air and it can trigger allergic reactions in your pets. Ragweed tends to hang around until the first frost falls so its effects can linger. Also be aware that your pets can react to mold and dust mites that come around this time of the year. If your pet is having an allergic reaction it can exhibit symptoms through its skin. Behaviors such as excessive licking, biting or scratching are clues that there could be a problem. Bear in mind, though, that these behaviors can also be indicative of food or drug allergies. If you notice abnormal licking, biting or scratching please consult your primary veterinarian and be sure to ask about the option of seeing a specialist. Our board-certified dermatologist, Dr. Terry Grieshaber, can talk you through all of the testing options that can help uncover an allergy and how you can manage it. potential to create dangerous situations. Make sure that your candy is always stored in a place that is safely out of reach of your pets or, if candy is out, that you don’t leave your pets unmonitored around it. Take special care that those trick-or-treating bags aren’t left on the living room floor! Different chocolates (dark, semi-sweet, white, milk, etc.) have different toxicity levels. If your pet happens to ingest any chocolate it is important to contact a veterinarian right away. We provide 24-7 emergency care so if your primary veterinarian is closed we are here to help. Harvest festivals abound in the fall as communities come together to celebrate farmers reaping the rewards of a hard summer’s work. It is worth noting, however, that harvest time can be dangerous to farm dogs and cats. Always be sure to double (or triple) check that all of your dogs or cats are not out exploring the fields and are out of harm’s way. temperatures by entering your home, garage or barn. However, they can pose a serious threat to household pets. If you suspect your pet ingested any amount of rodendticide it is essential that you contact a veterinarian immediately. Different brands of rodenticides contain different ingredients, but new products on the market contain a chemical that is especially dangerous according to Dr. Amy Rader, director of the emergency department at Circle City Veterinary Specialty and Emergency Hospital. If you plan to add antifreeze as part of preparing your car or truck for the colder temperatures take extra care to protect your pets. Ethylene glycol, the main ingredient in antifreeze, is highly toxic to animals. Store your antifreeze containers safely out of reach of your pets, and keep them away from the area whenever you add antifreeze to your car. Any spill should be cleaned immediately with the cloth or paper towel disposed of in a place where your pets can’t reach it. Doctor Rader also states that “there are pet friendly anti-freezes on the market and can be found at most stores, so if a pet owner has to add coolant or winterize the pool the pet friendly versions are less toxic.” It’s a good idea to check with your local retailer to find out if it carries that type of antifreeze.